Have you ever pick something up from the thrift store and forget to use it for years? 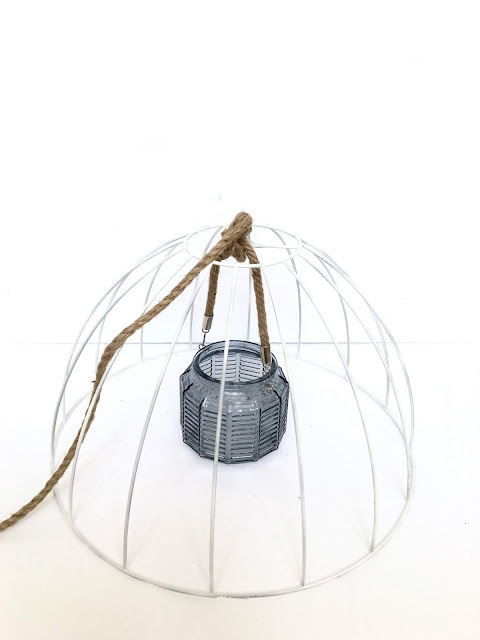 That's what happened with this DIY Outdoor Chandelier. 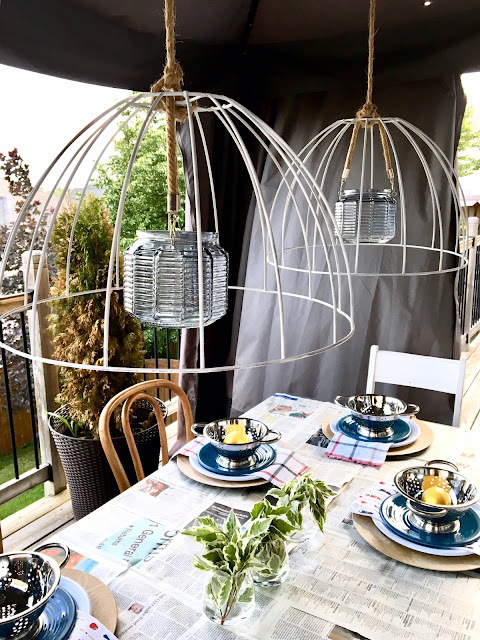 I had purchased these hanging lamps from a thrift store a few years back knowing I would use them someday (probably for my patio). When my husband and I planned our first lobster dinner party this summer I knew these lamp shades would make the perfect outdoor chandeliers. 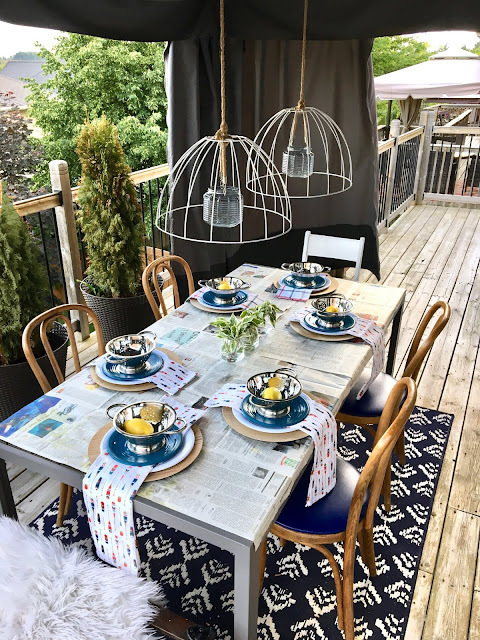 I've been thrilled to partner with Krylon Canada on a few projects this year, you may have caught my Spring Collection project where I spray painted my foyer baskets. So I was excited to spray paint these metal frames with the Krylon Summer Collection. 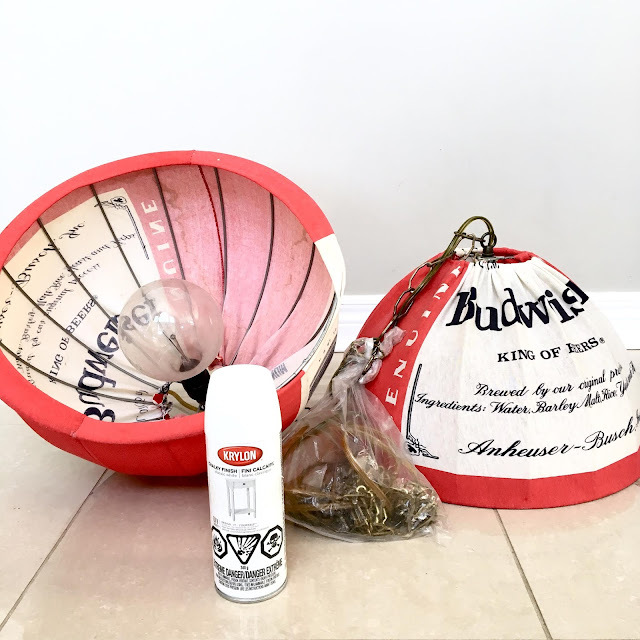 I pulled out my thrift store find from storage in all it's budwiser goodness. I imagine in their day they were an original DIY project to hang over someone's basement pool table. I could tell they were hand made because they were hand sewn and the wiring was questionable (one was plug-in and one was hard-wired). After removing the budwiser material (which appeared to be a pillow case) I used some pliers to remove the electrical. 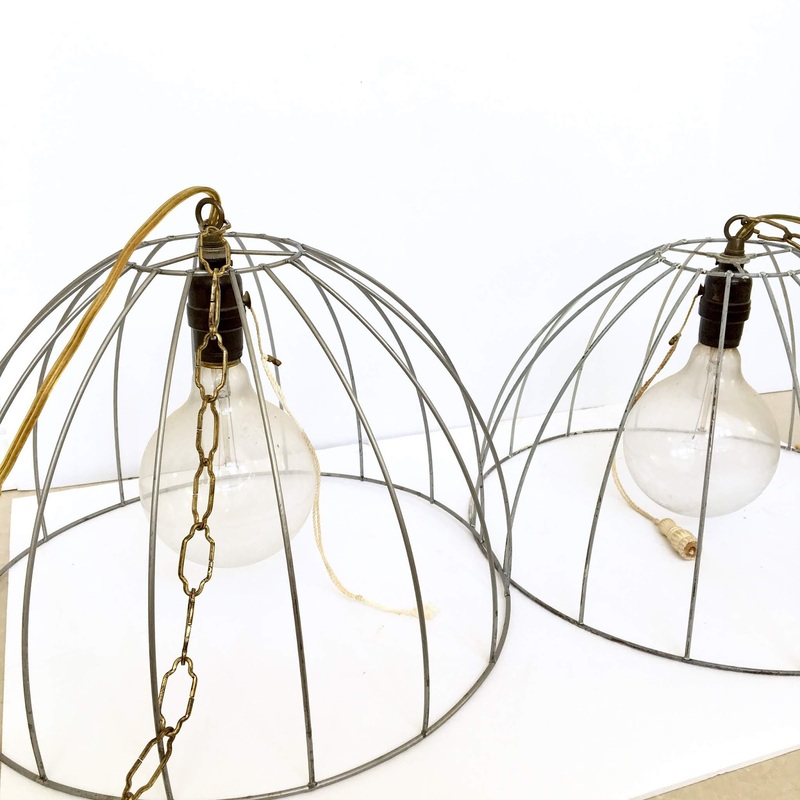 Side note, I do secretly love these globe bulbs. I selected Satin Ivory from the Tiffany Pratt X Krylon Summer Collection for the lamp shades. I started by priming the metal frame shades. It was a bit tricky to spray paint the thin wire and I felt like most of the paint landed on the ground. I found picking them up and rotating them (with drying in between) helped cover all the nooks and crannies. Finally I finished them off with a coat of Satin Ivory. 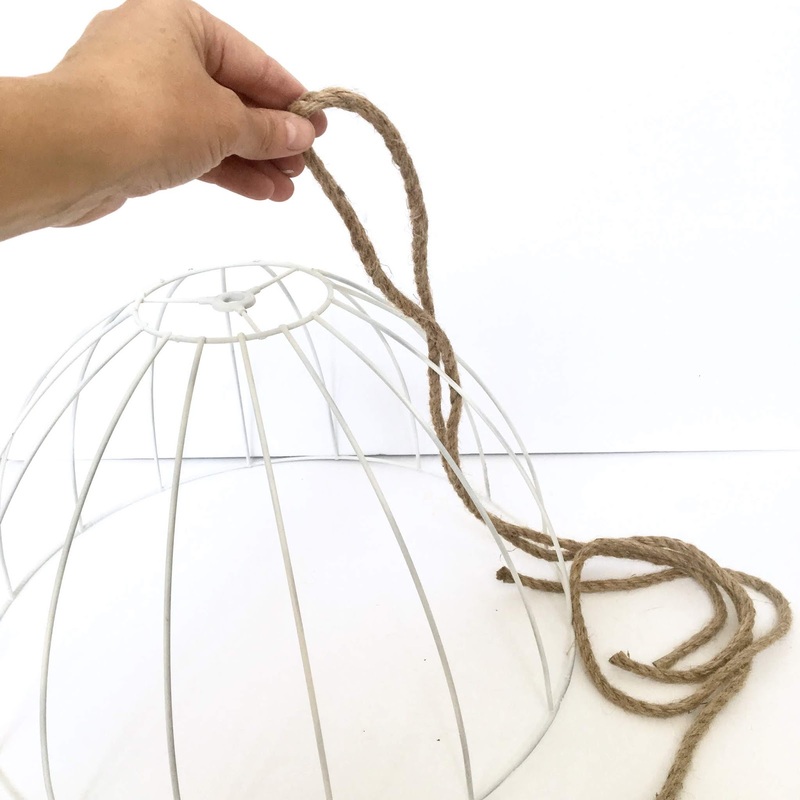 Then I grabbed some nautical type rope and tied it to the top of the metal shade. Next I hung a candle holder from Kitchen Stuff Plus in the center of the shade using the same nautical rope. That was it. 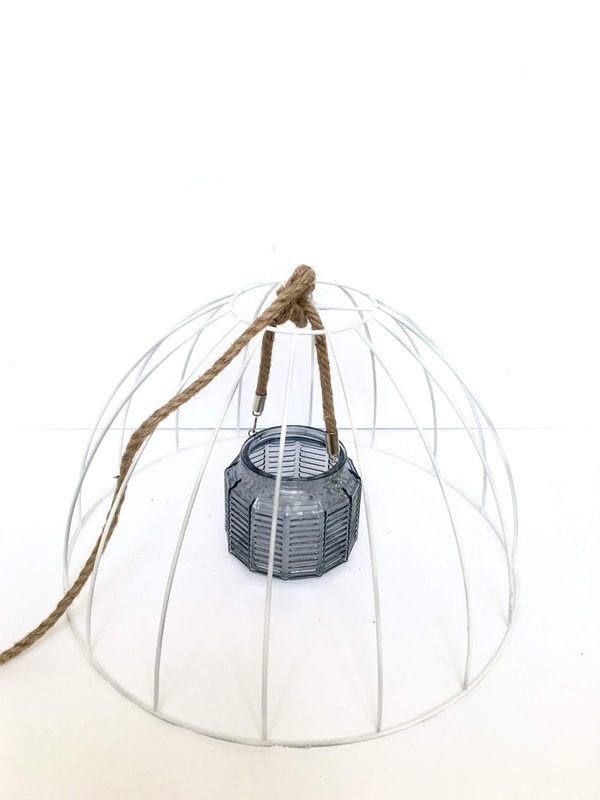 A simple DIY Outdoor Chandelier project. I have a feeling I will be using the lamp shades for many more projects in the future. Luckily spray painting them is so easy and fun I can change out the colour whenever the mood strikes. Our lobster dinner was amazing - you can read all about the set-up here. 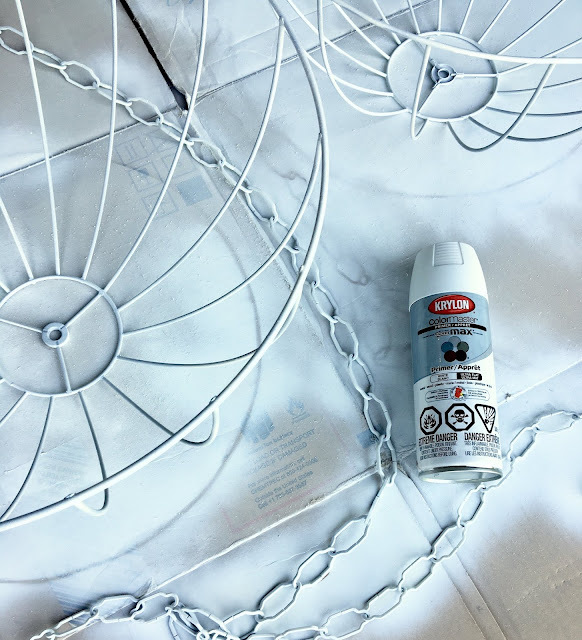 And by the way, if you have a spray painting project in the works be sure to post a pic of your final project to Instagram and tag #mykrylondiy and myself @harlowandthistle . I look forward to checking them out! This post is in collaboration with Krylon Canada. All expressed opinions are my own. I honestly get such a dreamy enchanted vibe from these chandeliers. Love love love!